Bioconsultant Schuchardt & Scholle. ‘Environmental Impact Assessment Europipe II in Germany: Offshore & Onshore Section’. Environmental Impact Assessment. Client: Statoil Deutschland. Bremen, July 1998. https://www.equinor.com/content/dam/statoil/documents/impact-assessment/Statoil-Environmental Impact Assessment Europipe II July 1998.pdf. Brenner, N. ‘Theses on Urbanization’. Public Culture 25, no. 1 69 (1 January 2013): 85–114. https://doi.org/10.1215/08992363-1890477. Brown, R.N. Rudmose. ‘Holderness and the Humber’. In Great Britain: Essays in Regional Geography, 812–21. Cambridge: Cambridge University Press, 1928. BSH. ‘Anlage Zur Verordnung Über Die Raumordnung in Der Deutschen Ausschließlichen Wirtschaftszone in Der Nordsee (AWZ Nordsee-ROV) Vom 21. September 2009’. Bundesanzeiger Verlag GmbH, 21 September 2009. https://www.bsh.de/DE/THEMEN/Offshore/Meeresraumplanung/Nationale_Raumplanung/_Anlagen/Downloads/Raumordungsplan_Textteil_Nordsee.pdf?__blob=publicationFile&v=1. Couling, Nancy. ‘Formats of Extended Urbanisation in Ocean Space’. In Emerging Urban Spaces- a Planetary Perspective, edited by Philipp Horn, Paola Alfaro d’Alençon, and Ana Claudia Duarte Carduso, XII, 219. The Urban Book Series. Springer International Publishing, 2018. ———. ‘Legislation of the Sea: Spatializing a New Urban Realm.’ In ARCH+ Legislating Architecture, 225:120–23. Aachen: ARCH+ Verlag GmbH, 2016. http://www.archplus.net/home/archiv/artikel/46,4676,1,0.html. ———. ‘Urbanization of the Ocean; Extractive Geometries in the Barents Sea’. In Infrastructure Space. LaFargeHolcim Forum for Sustainable Construction. Berlin: Ruby Press, 2016. Duerfahrd, Lance. ‘A Scale That Exceeds Us: The BP Gulf Spill Footage and Photographs of Edward Burtynsky’. Imaginations- Journal of Cross-Cultural Image Studies . Revue d’études Interculturelles de l’image 3–2, no. Sighting Oil (6 September 2012): 115–29. Engel, Henk, Esther Gramsbergen, Henk Hoeks, and Reinout Rutte, eds. OverHolland 10: The Transformation of the Landscape of the Western Region of the Netherlands (9th to 21st Century)’. OverHolland- Architectural Studies for Dutch Cities, 10/11. Amsterdam: Sun Publishers or Faculty of Architecture TU Delft, 2011. http://www.bk.tudelft.nl/en/current/agenda/event/detail/boekpresentatie-overholland-1011/. European Commission. ‘Eurostat Statistics Explained- Maritime Ports Freight and Passengeer Statistics’, March 2018. https://ec.europa.eu/eurostat/statistics-explained/index.php?title=Maritime_ports_freight_and_passenger_statistics. European Committee (UK). ‘The North Sea under Pressure: Is Regional Marine Co-Operation the Answer?’ HL Paper. London: House of Lords, 17 March 2015. https://publications.parliament.uk/pa/ld201415/ldselect/ldeucom/137/137.pdf. Gabriel Dupuy. Urban Networks-Network Urbanism. Edited by Jeroen van Schaick and Ina T. Klassen. Amsterdam: Techne Press, 2008. Ghosn, Rania. ‘Energy as a Spatial Project’. In Landscapes of Energy, 7–10. New Geographies 2. Cambridge, Mass: Harvard University Press, 2009. Gorman, D. G., and J. Neilson, eds. Decommissioning Offshore Structures. Environmental Engineering. London; New York: Springer, 1998. Grann, Henning. ‘Europipe Development Project: Managing a Pipeline Project in a Complex and Sensitive Environment’. In The Industrial Green Game, 154–64. Washington DC: National Academy Press, 1997. https://www.nap.edu/read/4982/chapter/14. Gugger, Harry, Nancy Couling, and Aurélie Blanchard, eds. Barents Lessons. Teaching and Research in Architecture. Zürich: Park Books, 2012. Harvey, David. The Urban Experience. Oxford: Blackwell, 1989. Hein, Carola. ‘Analysing the Palimpsestic Petroleumscape of Rotterdam’. Global Urban History Blog (blog), 28 September 2016. https://globalurbanhistory.com/2016/09/28/analyzing-the-palimpsestic-petroleumscape-of-rotterdam/. ———. ‘Between Oil & Water: The Logistical Petroleumscape’. In The Petropolis of Tomorrow, 228–37. New York: Actar Publishers and Architecture at Rice, 2013. ———. ‘Global Landscapes of Oil’. In Landscapes of Energy, 7–10. New Geographies 2. Cambridge, Mass: Harvard University Press, 2009. ———. ‘Oil Spaces: The Global Petroleumscape in the Rotterdam/The Hague Area’. Journal of Urban History, 13 February 2018, 0096144217752460. https://doi.org/10.1177/0096144217752460. ———. ‘Old Refineries Rarely Die’. Canadian Journal of History forthcoming (2018). ———. 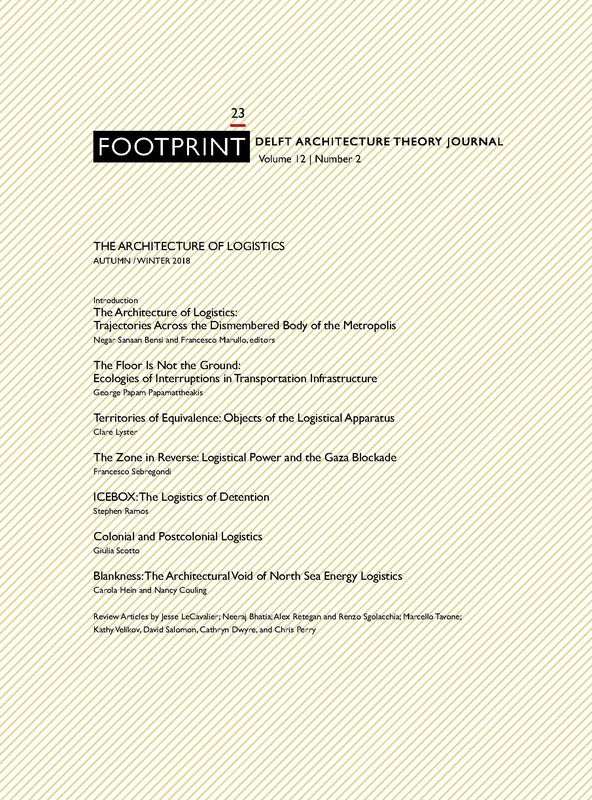 ‘Port Cities: Nodes in the Global Petroleumscape between Sea and Land’. Technosphere Magazine, 15 April 2017. /p/Port-Cities-Nodes-in-the-Global-Petroleumscape-between-Sea-and-Land-mpc8kjktvGaTxxDq3tfvF7. ———. ‘Temporalities of the Port, the Waterfront and the Port City | PORTUS - Port- City Relationship and Urban Waterfront Developmdent’. PORTUS: RETE Online Magazine, June 2015. http://portusonline.org/temporalities-of-the-port-the-waterfront-and-the-port-city. Hein, Carola, and Mohamad Sedighi. ‘Iran’s Global Petroleumscape: The Role of Oil in Shaping Khuzestan and Tehran’. Architectural Theory Review 21, no. 3 (1 September 2016): 349–74. https://doi.org/10.1080/13264826.2018.1379110. Julian Manning, BVaker Hughes Process & Pipeline Services. ‘2 Nations, 1 Basin- Same Challenges’. presented at the Offshore Energy Conference 2017, Amsterdam, 10 October 2017. K. Chapman. North Sea Oil and Gas: A Geographical Perspective. Problems in Modern Geography. Newton Abbot a.o: David & Charles, 1976. Kaika, Maria, and Erik Swyngedouw. ‘Fetishizing the Modern City: The Phantasmagoria of Urban Technological Networks’. International Journal of Urban and Regional Research 24, no. 1 (2000): 120–138. https://doi.org/10.1111/1468-2427.00239. Kipnis, Jeffrey., and Alexander. Maymind. A Question of Qualities: Essays in Architecture. Writing Architecture Series. Cambridge, Mass; MIT Press, 2013. Lawrence, Felicity, and Harry Davies. ‘Revealed: BP’s Close Ties with the UK Government’. The Guardian. 21 May 2015. https://www.theguardian.com/environment/2015/may/20/revealed-bps-close-ties-with-the-uk-government. Lefebvre, Henri. The Production of Space. Translated by Donald Nicholson-Smith. Oxford, UK etc: Blackwell, 1991. Mangabiera Unger, Roberto. ‘The Better Futures of Architecture’. In Anyone, edited by Cynthia C. Davidson. New York, New York: Rizzoli, 1991. Mark E. J. Newman. Networks: An Introduction. Oxford: Oxford University Press, 2010. North Sea Commission. ‘CPMR North Sea Commission – Integration Approach to Sustainable Development in the North Sea Region’. Brussels & Gothenburg: North Sea Commission, 27 November 2017. http://cpmr-northsea.org/download/cpmr-north-sea-commission-integration-approach-to-sustainable-development-in-the-north-sea-region/. Pardo. ‘Speech to the United Nations General Assembly 22nd Session, Official Records.’ United Nations, 11 January 1967. http://www.un.org/Depts/los/convention_agreements/texts/pardo_ga1967.pdf. Port of Rotterdam. ‘Throughput Port of Rotterdam 2017’. Statistics. Rotterdam: Port of Rotterdam, 2018. https://www.portofrotterdam.com/en/news-and-press-releases/container-throughput-drives-growth-in-rotterdam. Pye, Michael. The Edge of the World: How the North Sea Made Us Who We Are. London: Penguin Books, 2015. Statistica. ‘Number of Offshore Rigs Worldwide as of January 2018 by Region’. Statistics. London; New York: Statistica Ltd., 2018. https://www.statista.com/statistics/279100/number-of-offshore-rigs-worldwide-by-region/. Steinberg, Philip E. The Social Construction of the Ocean. Cambridge Studies in International Relations 78. Cambridge [etc. ]: Cambridge University Press, 2001. The European Parliament and the Council of the European Union. Directive 2014/89/EU (2014). http://eur-lex.europa.eu/legal-content/EN/TXT/?uri=uriserv:OJ.L_.2014.257.01.0135.01.ENG%20. Timmermans, Willem, J. ‘The Future of Offshore Pipelining’. Offshore Magazine 62, no. 6 (6 January 2002). UN. ‘UNCLOS 1982’, 1982. http://www.un.org/Depts/los/convention_agreements/ convention_overview_convention.htm. UNESCO, and IOC. ‘Marine Spatial Planning Programme’. Accessed 3 June 2018. http://msp.ioc-unesco.org/. ‘Università Iuav Di Venezia - Erasmus Mundus Master Course in Maritime Spatial Planning’, 3 July 2018. http://www.iuav.it/Didattica1/master/master---I1/Erasmus-Mu/. White, Mason, and Lola Shepherd. ‘New New Deal: Infrastructures on Life Support’. In Infrastructure as Architecture: Designing Composite Networks, edited by Katrina Stoll and Scott Lloyd. Berlin: Jovis, 2010. Whitfield, Matthew. ‘Grimsby Fishdocks- an Assessment of Character and Significance’. Historic England Kasbah Report. Great Grimsby Ice Factory Trust, April 2009. http://www.ggift.co.uk/historic-england-kasbah-report/. Wilson, Sheena, and Andrew Pendakis, eds. ‘Sight, Site, Cite. Oil in the Field of Vision’. Imaginations: Journal of Cross-Cultural Image Studies, Sighting Oil, 3, no. 2 (9 June 2012). http://www3.csj.ualberta.ca/imaginations/?page_id=4020. Nancy Couling completed her PhD in architecture “The Role of Ocean Space in Contemporary Urbanization” at the EPFL (Ecole Polytechnique Fédéral de Lausanne), Switzerland in 2015, after much international practice experience and gaining her B. Arch (hons) at the University of Auckland, New Zealand. Based in Berlin from 1995-2010, she founded her own urban design practice cet-0 / cet-01 with partners Susanne Schnorbusch Architect and Klaus Overmeyer Landscape Architect and was a teaching assistant in Architecture and Urban Design for Prof. Klaus Zillich at the Technische Universität Berlin. She recently joined the Chair of History of Architecture & Urban Planning, TU Delft, Prof. Carola Hein, as a Marie Curie Research Fellow with the project OCEANURB- the Unseen Spaces of Extended Organization in the North Sea, 2017-2019, investigating the sea-borne spatial implications of extended urbanization (Brenner & Schmid). “Barents Lessons, Teaching & Research in Architecture” (Gugger, Couling & Blanchard 2012) was awarded a “most beautiful Book” award both in the Swiss Federal Design Awards 2012 and from the German Stiftung Buchkunst in the category teaching & research 2013. Carola Hein is Professor and Head, History of Architecture and Urban Planning Chair at Delft University of Technology. She has published widely in the field of architectural, urban and planning history and has tied historical analysis to contemporary development. Among other major grants, she received a Guggenheim Fellowship to pursue research on The Global Architecture of Oil and an Alexander von Humboldt fellowship to investigate large-scale urban transformation in Hamburg in international context between 1842 and 2008. Her current research interests include the transmission of architectural and urban ideas, focusing specifically on port cities and the global architecture of oil. She has curated Oildam: Rotterdam in the oil era 1862-2016 at Museum Rotterdam. She serves as IPHS Editor for Planning Perspectives and as Asia book review editor for Journal of Urban History. Her books include: The Routledge Planning History Handbook (2017), Uzō Nishiyama, Reflections on Urban, Regional and National Space (2017), History, Urbanism, Resilience, Proceedings of the 2016 IPHS conference (2016), Port Cities: Dynamic Landscapes and Global Networks (2011), Brussels: Perspectives on a European Capital (2007), European Brussels. Whose capital? Whose city? (2006), The Capital of Europe. Architecture and Urban Planning for the European Union (2004), Rebuilding Urban Japan after 1945 (2003), and Cities, Autonomy and Decentralisation in Japan. (2006), Hauptstadt Berlin 1957-58 (1991). She has also published numerous articles in peer-reviewed journals, books, and magazines. COULING, Nancy; HEIN, Carola. Blankness. FOOTPRINT, [S.l. ], p. 87-104, nov. 2018. ISSN 1875-1490. Available at: <https://journals.open.tudelft.nl/index.php/footprint/article/view/2038>. Date accessed: 21 apr. 2019. doi: https://doi.org/10.7480/footprint.12.2.2038.